Canada Challenge and Other News !!! Back on board after a crazy summer of speaking, running and planning ! Planning what ? The Canada Challenge ! Please check out my website for more info- you'll see the link on the front page. My goal is to run 3 very extreme coastal trails in Canada- one right after the other. All in an effort to raise awareness for initiatives I totally am down with. Check the "awareness" section of my website. The trails are 1000's of km's apart, and will be super tough running combined with insane logisitics. 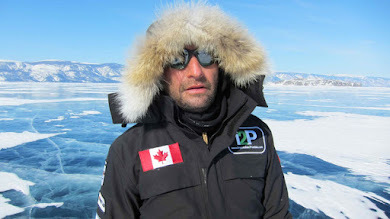 I start in canada's North on Baffin Island, then Newfoundland and finally British Columbia. I have incredible people helping in the planning- and without their expertise i don't think i could even be half as prepared ! Mike Kenney of Matrix Helicopters in North west Territories has been an incredible expediton advisor- helping to co-ordinate the complex logistics of the Baffin and Newfoundland sections of this "race against time". 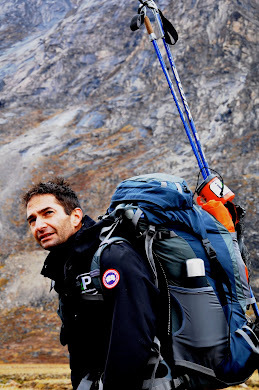 More to come on the interesting stories of people, training and logistics involved in this expedition. By the way...we leave this August 21st 2007 ! Media so far has been awesome- and the story has appeared in newspapers across the country ! Clients have also had amazing spring/summer events. Please check my website for details under "client news". Talk soon- I am off to salt Lake City with Charlie. It’s hard to believe but the summer is here! I would like to take this time to thank you for all of your support over the past several months. Life has certainly changed and it’s so exciting to look back on this past winter! Dreams have come true but I couldn’t have done all that without all of you. My friends and family have been so incredible. You may remember getting a newsletter from my brother John while I was in the Sahara. I’d like to personally introduce you…everyone, meet John Zahab! John is a Certified Strength and Conditioning Specialist at the Ottawa High Performance Centre. His assessment protocol and program development are a great addition to my online coaching services – geared to get you running. Not all of you are my coaching clients but I still wanted to tell you about him! In addition to providing Strength and Conditioning for Sports Performance services, John offers conditioning programs for Return to Sport (after injury) and Functional Fitness (for the active individual, who may not participate in athletic events). Additional information on John’s services and other great services offered at the center may be found at www.ohpc.ca. John offers a variety of appointment times throughout the day – including some early morning and evening times, to accommodate before and after work needs. I’m looking forward to the weeks and months ahead, when I hope that I can continue to be an inspiration to many of you - as much as you have been an inspiration to me! May you come to soon realize all of your goals - be it performance oriented or leading a healthy active lifestyle. Should you have any questions regarding my brother’s services, please don’t hesitate to contact him directly at zahabj@istar.ca . Stay tuned for some updates about some of my clients. There’s a few different people racing around the world. I’ll keep you posted, until then, may you have a safe and healthy start to your summer! I'm sorry for taking a few weeks to write to you all! Thank-you all so much for all your support while I was in Africa!! It was so amazing to get all the emails and hear news from home! It's been great to home! It was pretty funny stepping back into a Canadian winter after being in the desert for so long but I'm so happy to be home! I just returned back from the Northwest Territories and serious winter! It was great to be there for a couple of talks and to be there for the race as well! I'll write more later but wanted to send you all a quick hello and word of thanks. Right now Kathy and I are on our way to California where Kevin, Charlie and I will be on the Tonight Show! You can watch us on Tuesday night (tomorrow night). It will be great to see the guys! Stay tuned in for more updates! If you tuned in tonight to The Hour you would have seen that Ray will actually be on tomorrow night! *watch Ray tell his story! Ray has been back on Canadian soil now for a full week and it's definitely been busy! Hopefully you've had a chance to see him on TV or catch him on the radio. It's been exciting to hear from people all over the country about how Ray has inspired them. On Monday March 5 you will be able to watch Ray tell his story on The Hour with George Stroumboulopoulos on CBC Television at 11 pm. Tune in! Hope you all out there are doing well! Many thanks to everyone for coming out to support Ray tonight, for keeping up to date with his progress, and for sending encouraging emails while he was away! It has meant a lot to Ray! It's so very easy to get caught up in life's troubles and forget what's going on in the world around us. A big thanks to Ray, Kevin and Charlie for giving up the past 4 months to remind us all that nothing is impossible. And also for bringing exposure to the water crisis in Africa. We have much to be thankful for as life hands us our possibilities! Just a quick note to let you know Ray & Kathy will be on CTV's Canada AM on Monday morning! Please keep checking here over the week-end for an update on timing. It's also quite possible there willbe another TV spot for Ray early next week. Info will be up as soon as we know! Tune in! And make sure you read your Ottawa Citizen on Sunday! 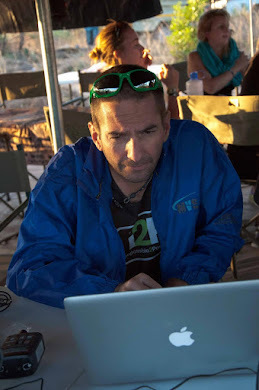 Keep those messages for Ray coming (please send to jenny@rayzahab.com)! Any words of encouragement, well wishes and stories of how Ray's journey has touched you would be great! Hope to see you at the airport tomorrow night (Friday night) at 11:00! Things are busy in preparation for Ray's return to Canada! There has been a tremendous response from the media and people all over the world! It's so exciting to know how inspired people have been. If you have a special story about how Ray's journey has touched you please send me an email with the story. I will compile them all together and give to Ray when he gets home! All stories and well wishes welcome!! Ray & Kathy will be returning to the airport on Friday night (Feb.23) at approximately 11:00pm (landing at about 11:10). If you would like to join us in welcoming them home please come! We'll be gathered in the arrivals area. Please feel free to get creative and bring signs/balloons! Check out the article featured on yahoo today...click here! If you have any inquiries concerning booking an interview or speaking engagement with Ray please contact me! Have a coffee in your hand? ...good enough! Time to raise it to Ray! On Tuesday Feb.20 Ray and the team completed their journey! It's been done, the impossible has been conquered! Stay tuned for details regarding Ray's return to Ottawa (likely Feb.23). We're hoping to have a greeting party at the airport to welcome him home! Time to get those signs and balloons out! Ray had family with him at the journey's completion but most importantly Kathy, his amazing wife! Here's to 2 of the most amazing people in the world! Ray, we're inspired and so very proud of you...we knew you could do it! 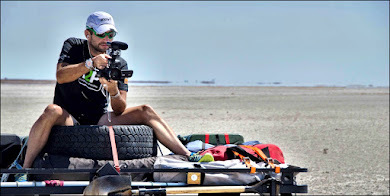 In just days from now Ray and the team are expected to finish Running the Sahara! I'm quite certain this expedition will seriously raise the bar of all that we consider possible. Kathy left late last week to join Ray for the expedition's last 500Km's, while family and friends will leave in a few days to join them as well. A dip in the Red Sea will complete things and it's expected the team will do this on the 18th or 19th. Ray will likely be home on Feb.23 but I'll keep you posted with updates! There will be a welcoming party at the airport, please feel free to join in! Stay tuned for details regarding arrival time! Please note that ball class will be cancelled for the next 2 weeks and will resume Feb.27 (6pm). Will have more updates for you soon! Exciting times!!! I have finally settled back into my normal routine after spending a week in Niger with Ray, the team, and Lisa and Nicole (Charlie and Kevin’s girlfriends, respectively). We had an amazing week! Ray and I had not seen each other in 2 months; it was incredibly emotional to see his smiling face when I arrived! He has lost some weight but looks great - one would never guess he’d already run close to 4000kms at that point! Unfortunately both Lisa and I lost of luggage on the way to Agadez (still in London as it turns out!). I felt terrible as I had packed some pencils, paper and Canada teddy bears for when Ray and the guys have the opportunity to visit the local schools. Also in the luggage were gifts of coffee and chocolate (desert treats!) from our family and friends to Ray for Christmas. Even though the bags did not arrive, Ray really appreciated the fact he was in your thoughts. Ray was happy to see I arrived safely, and I was happy to see that he is doing so well!! We spent the next five nights camping in the most spectacular areas of the Desert. It is very inspiring how day after day after day these guys wake up, have a quick bite to eat, and are running before sunrise. Myself, Nicole and Lisa would typically sleep in until after sunrise, eat, and catch up with them via the Land Cruiser (we actually did get up a few mornings in time to see the sunrise)! Our routine would be to drive ahead of the guys maybe 5-10km, stop and prepare Gatorade for them, offer them words of encouragement and then continue on. While we were in the Desert there were several sandstorms which would be reason enough to stop the average person from running…not these guys! The 50-60km winds only fueled their fire to finish those days…coming into camp with sand-caked faces! They are so strong and so motivated! As Niger is a French speaking country, our friends in Quebec will be pleased to know that Ray is pretty much bilingual now and speaks fluently with the local peoples (the Tuaregs). The Tuaregs we met were so kind and gracious, and they have a strong sense of community – it was a wonderful opportunity to learn more about their culture. Being there also made me realize that even with the lack of infrastructure, including wells to supply clean drinking water, people make the best of what they have and do not waste anything. The Desert itself is extremely beautiful – we saw lots of camels and donkeys, huge sand dunes, and you can see so many stars at night. Ray and I would count our lucky stars (all pun intended!) – it was an amazing way to spend out first Christmas as a married couple! Since 2004 Ray has raced in Morocco, Niger, Libya, and Egypt and has always told me how much he loves the Sahara – in particular, the people and the sand dunes. Having just spent only 1 week in the desert in Niger, I too know its lure. What Ray, Charlie and Kevin have accomplished thus far is a feat of strength and perseverance. Raising awareness with respect to the lack of clean drinking water in Africa is of paramount importance. 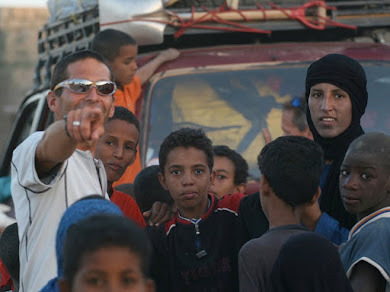 Please check out the website at www.runningthesahara.com for more details on the expedition, the charity (H20 Africa), and the documentary film. Happy New Year - Ray on Canada AM! This will definitely be a New Year's Ray will not forget! 2 Announcements for you today! First, Ray will be on Canada AM tomorrow morning (Wednesday Jan. 10) for a 5 minute interview via sat. phone at 7:15 am sharp!! Please tune in and let anyone else who might be interested know. We'll try to bring you details of the interview later this week. Second, ball classes have resumed from their holiday break! Classes are 6-6:45 pm Tuesday's and Thursday's at the Churchill Seniors Centre in Westboro. Registration is $100+gst for 10 classes. Please don't hesitate to contact jenny@rayzahab.com for directions. See you in front of the TV tomorrow morning 7:15am...Canada AM on CTV!